Graduated from Kakatiya University, Warangal with distinction and M.Sc., M.Phil. and Ph.D in Statistics from Osmania University, Hyderabad. Was awarded "University First Ranker" for securing highest marks in M.Sc. (Statistics) for the academic year 2003-2005. He Was awarded "Dr. M.N. Gopalan Award- Young Statistician Award Competition for the Year 2007", from Indian Society for Probability and Statistics and a “Gold Medal in Honour of Prof. C.R. Rao” from Sri Venkateshwara University on the occasion of 3rd National Statistics day celebrations, 2009. Involved in three ongoing projects as a statistician. Faculty member of the M.Sc. (Applied Nutrition) course and Post Graduate Certificate Course in Nutrition at National Institute of Nutrition. Madhari S. Radhika, Boddula Swetha, B. Naveen Kumar, N. Bala Krishna and AvulaLaxmaiah(2018), Dietary and nondietary determinants of nutritional status among adolescent girls and adult women in India,Annals of the New York Academy of Sciences, 2018. Arjun L. Khandare ,VakdeviValidandi, Naveen Boiroju (2018), Fluoride Alters Serum Elemental (Calcium, Magnesium, Copper,and Zinc) Homeostasis Along with Erythrocyte Carbonic Anhydrase Activity in Fluorosis Endemic Villages and Restores on Supply of Safe Drinking Water in School-Going Children of Nalgonda District, India. Biological Trace Element Research. Naveen Kumar Boiroju and K. Venkaiah (2018), Nutritional Status of the Population in Bundelkhand Region, The Indian Journal of Nutrition and Dietetics, Vol. 55 (3), July-September 2018. II Meshram, Naveen Kumar Boiroju, Venkaiah Kodali (2017), Ranking of Districts in Andhra Pradesh using Women & Children Nutrition and Health Indicators by TOPSIS Method,Indian Journal of Community Health,29(4), 2017. RamuYerukala, Naveen Kumar Boiroju and KolluRanga Rao (2017), Approximations to three essential functions of standard normal distribution, International Journal of Mathematics and Statistics, Vol. 18 (1), 12-20. 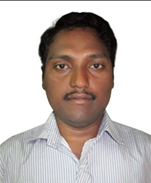 Naveen Kumar Boiroju, D. Vijaya Bhaskara Rao and K. Venkaiah (2016), Application of Ridit Analysis to Study the Severity of Anemia Among Children, Adolescents and Pregnant Women in Andhra Pradesh, Sri Lankan Journal of Applied Statistics, vol 18-1, 49-68. Naveen Kumar Boiroju, I. I. Meshram, D. Vijayabhaskara Rao, M. S. Radhika and K. Venkaiah (2016), Ranking of The Districts Using a Composite Index Based on the Nutritional Status of Under 5 Year Children in Telangana State, International Journal of Nutrition and Dietetics, Vol. 4 (1), 71-83. Naveen Kumar Boiroju and K. Venkaiah (2016), A New Algorithm for Generating Gaussian Random Numbers, International Journal of Agricultural and Statistical Sciences, Vol. 12 (2), 307-310. R. Ramakrishna and Naveen Kumar Boiroju (2015), New approximations to student t-distribution, Advances in Applied Science Research, Vol. 6 (11), 16-22. Assessment of the Effect of ‘Anna Amrutha Hastham (AAH)’ on Nutritional Status of pregnant women, lactating mothers and their under 3 year children in the State of Andhra Pradesh. System of Promoting Appropriate National Dynamism for Agriculture and Nutrition (SPANDAN): Integrated Survey on Agriculture & Nutrition. Dietary adequacy of supplementary food for 06-35 month old children provided by the government implemented Integrated Child Development Scheme in India – A multi-centric study using Linear Programming (LP) Approach (Optifood Project). Technology development and efficacy testing of extruded rice fortified with iron, folic acid and vitamin B12. Assessment of Situational Analysis of Food and Nutrient Intakes of Young Children to Enable to Develop Local Food Models for Improving Infant and Young Feeding In The States of Chhattisgarh, Gujarat, Madhya Pradesh And Uttar Pradesh In India. Prevalence of Fluorosis in The Community of Selected Districts of India And Development of An Appropriate Intervention Model for Prevention and Control of Fluorosis. Received "Second Prize" in the evaluation of the 16th foundation training programme for scientists and technologists conducted by Indian Institute of Public Administration (IIPA), New Delhi. Received “Research Fellowships for the Meritorious Students” from UGC to carry out my Ph.D. program. Received “Gold Medal in Honour of Prof. C.R. Rao” from Sri Venkateshwara University on the occasion of 3rd National Statistics day celebrations, 28-29, June, 2009. Received “Dr. M.N. Gopalan Award-Young Statistician Award Competition for the Year 2007”, from Indian Society for Probability and Statistics.